Home » US News » Shingrix shortage: Is Schumer linking it to the shutdown? Earlier this week, Senate Minority Leader, Chuck Schumer of New York made a statement concerning the shortage of the popular shingles vaccine, Shingrix and seemed to link it to the current government shutdown. “To think that in the midst of a shingle shot vaccine shortage across Central New York, that the FDA is shutdown, is a worrisome thought and a problem that must be addressed,” said Senator Schumer. However, as numerous media outlets have reported for months–their has been a shortage of the vaccine long before the shutdown. The vaccine received FDA approval in Oct. 2017 and since then it has been hugely popular. GlaxoSmithKline spokesperson, Sean Clements told the NY Times last September, “Uptake was very, very quick, and enthusiasm was very high”. At that time, the manufacturer of Shingrix called the level of demand unprecedented. GSK even has a Vaccine Locator if you want to find out where it’s available. 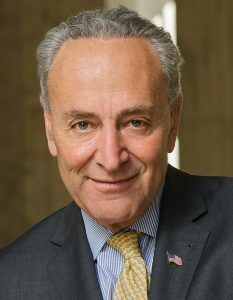 Is it fair for Sen. Schumer to in any way link this long-term shortage on the government shutdown? Why did he wait for now to consider this an “emergency”? You can answer those questions for yourself. Remember, this is a hugely popular vaccine that even the CDC has endorsed over the former vaccine: Shingrix is the preferred vaccine, over Zostavax® (zoster vaccine live), a shingles vaccine in use since 2006. I would question, even when the FDA was fully functioning prior to the shutdown, the shortage was in full effect. The end of the government shutdown and the 100% restoration of the FDA would not solve the true underlying issue–supply and demand.